Mr. Huffman passed away on March 13, 2013 following a lengthy illness. Mr. Huffman was born in Rowan County, North Carolina on June 3, 1932. He attended college at Appalachain State Teachers College before joining the United States Army and serving a tour of duty in Japan during the Korean War. Upon his return home, he attended the University of North Carolina at Chapel Hill, receiving both a Master of Education and then his law degree. 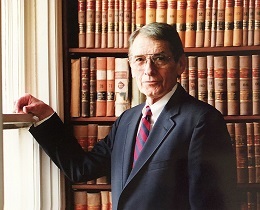 Mr. Huffman began his law practice in Monroe, North Carolina in 1961 and continued to be an active and valued member of the bar until his illness. Mr. Huffman enjoyed the collegiality of the courtroom and the intellectual pursuit of the law. He was known by all as both a formidable and skilled advocate for his clients, while maintaining the civility of a gentleman. His devotion to client-centered representation remains the focus of the firm he founded. He will be sorely missed. Huffman & Kendrick, PLLC is located in Monroe, NC and serves clients in and around Mineral Springs, Wingate, Monroe and Union County.